Carnegie Mellon University's five Fulbright Award winners for 2018 will conduct research and teach in Israel, Germany, Japan, Serbia and South Korea. The U.S. Department of State's Bureau of Educational and Cultural Affairs sponsors the Fulbright U.S. Student Program to "increase mutual understanding between the people of the United States and the people of other countries." Winners are selected based on a number of factors, including their proposal, called a "Statement of Grant Purpose," academic record and personal qualifications. ﻿Isabel Bleimeister, who earned her bachelor's degree in cognitive neuroscience with a minor in biomedical engineering this year, has been awarded a Fulbright Study/Research Grant. She will work with Associate Professor Ilan Dinstein at Ben-Gurion University of the Negev in Beersheba, Israel, on autism spectrum disorder research. Bleimeister said she will study autistic children's pupil dilations and eye movements to differentiate between subcategories of autism. Bleimeister is from Los Angeles. ﻿Zhiwan Cheung, who earned his master's degree in fine arts in 2016, will study the 1960s international art movement, Fluxus, as part of his Fulbright Study/Research Grant. In Germany, Cheung will study the art movement's origins and impact on German artists. By investigating Fluxus' visual, verbal and performative languages through archival research and workshops, he expects his work will enrich his understanding of the complexities of cultural identity within an international art context.﻿ Cheung is from Hanover, New Hampshire. ﻿Amal Nanavati, who earned his bachelor's degree in computer science and global studies this year, will be traveling to Kyoto, Japan, for his Fulbright Study/Research Grant. He will be conducting research in human-robot interaction under the supervision of Professor Takayuki Kanda at Kyoto University. Nanavati's research will investigate how robots can learn to work and communicate with humans in smooth, natural ways by observing human to human interactions. Nanavati of Fremont, California, also has received the inaugural $5,000 K&L Gates Prize, supported by the K&L Gates Endowment for Ethics and Computational Technologies. He earned the prize for inspiring fellow students to love learning through a combination of intellect, high scholarly achievement, engagement with others and character. ﻿Theodore Teichman, a 2018 graduate of the Bachelor of Science and Arts program with concentrations in neurobiology and music composition, will study music composition at the University of Arts and the Serbian Academy of Sciences and Arts in Belgrade, Serbia, as part of his Fulbright Study/Research Grant. His work will focus on the Balkan epic poetry tradition. Teichman will investigate the metaphorical connections between landscape, biological systems and mythology, and the human experience of coping and memory. Teichman hails from Loma Linda, California. ﻿Louise Zhou, who earned her bachelor's degree in business administration and human-computer interaction in 2017, will be traveling to South Korea for her Fulbright English Teaching Assistantship. Following orientation in Seoul, Zhou will teach English to middle school or high school students in a city outside of Seoul. She also plans to work with the Korean-American Educational Commission to help teach English to North Korean defector students looking to study abroad. Zhou is from Cupertino, California. 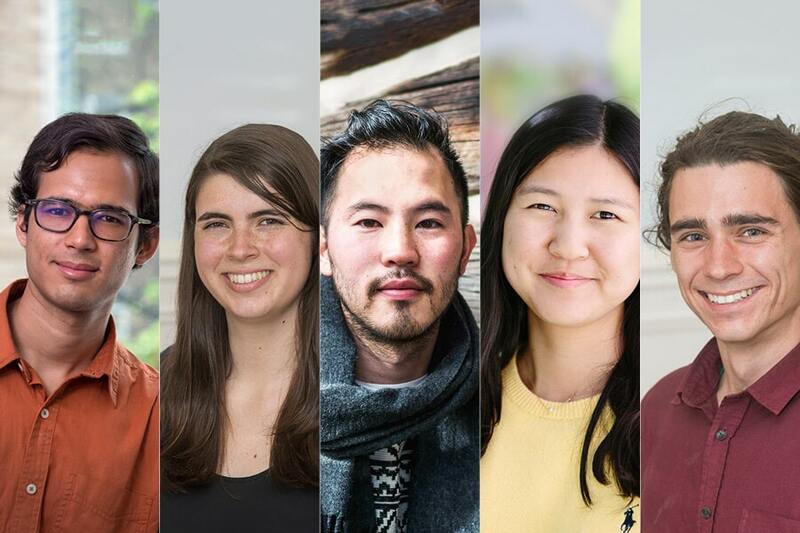 Carnegie Mellon's 2018 Fulbright winners are (l-r) Amal Nanavati, Isabel Bleimeister, Zhiwan Cheung, Louise Zhou and Theodore Teichman.